I just finished washing some dishes--once again, it seems as though Mr. Ben forgot to rinse the cereal out of his breakfast bowl and it was nice and stuck. I have so many projects I'd rather do than the dishes, but my dishwashing experience is going to get a bit more enjoyable soon, as I have some exciting news to share about a company I've adored for quite some time--Seventh Generation. Seventh Generation is a world renowned brand of natural household & personal care products which was founded in Burlington, Vermont in 1988. This privately held company's products can be found across the US and Canada in grocery stores, mass merchandise stores, natural foods stores and online. Creating products that are both healthy to humans and the earth is something the company is known for. Now Seventh Generation has a great new product -- liquid dish soaps naturally scented with fruits, herbs, and other botanicals. Unlike most soap fragrances, which are synthetically made in a lab with chemicals, Seventh Generation uses real scents from nature such as lavender, clementine, and real lemons in their Natural Dish Liquid. This product launch is being celebrated with the Nature Makes Perfect Scents sweepstakes. You will have the chance to win a trip for two to one of the regions where lemons, lavender, and clementines grow, including France, Italy, or lush & green Vermont, which is gorgeous all 4 seasons. The lucky winner gets to choose the region. I am personally very excited about this new line because aromatherapy--true aromatherapy using natural fragrances--is a big part of my life. When there are real scents from nature instead of chemically-made synthetic aromas, the olfactory experience is complete. Have you ever smelled a scent only to be taken back to a treasured moment from your childhood? When you're in your garden, is there a particular herb that makes you smile? When I smell lemons--true lemons--I am instantly cheered and invigorated. I'm reminded of my first pie attempt, Shaker Lemon Pie, back at the age of 12. I'm reminded of squeezing lemon after lemon a hot summer's day to fill a glass pitcher with the sweetest, most natural homemade lemonade. In my herb garden, I feel energized when I smell the peppermint leaves, and my children smile while picking basil because they know it means Mommy will be making sauce. Smelling tulips in the summer instantly reminds me of our big, kidney shaped flower bed in our front yard of my childhood home. Scents from nature can invoke so many different emotions and trigger memories. If you're going to be doing dishes, as so many of us busy moms are, why not engage in a bit of aromatherapy at the same time. You'll be washing your dishes with natural ingredients, but you will be able to enjoy a hint of natural fragrance. I'll be honest. I do not like doing the dishes. When you have messy kids who throw their dishes in the sink, it seems like it quickly fills up over and over again. We all need to wash dishes. It's a fact of life. 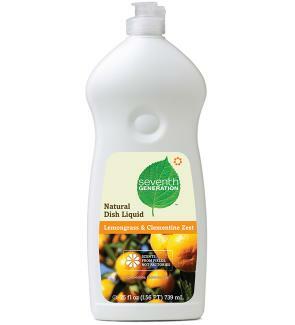 Why not make that necessary task more enjoyable using naturally scented Seventh Generation Natural Dish Liquid? The scents sound divine: Lavender Floral & Mint, Lemongrass & Clementine Zest, Fresh Citrus and Ginger, and as always purists will adore Free & Clear. Don't forget that you can head right over to the Seventh Generation site to learn more about their natural products (which I love for those with kids and pets since ingredients are so important) and to enter the sweepstakes! Disclosure: I wrote this blog post while participating in the SocialMoms and Seventh Generation blogging program, for a gift card worth $50. For more information on how you can participate, click here.